Nanaimo's Premier Photo booth including service to Parksville, Qualicum Beach, Tofino, Ladysmith, Duncan, Victoria and Nanaimo. This is the newest fad in wedding and corporate functions. 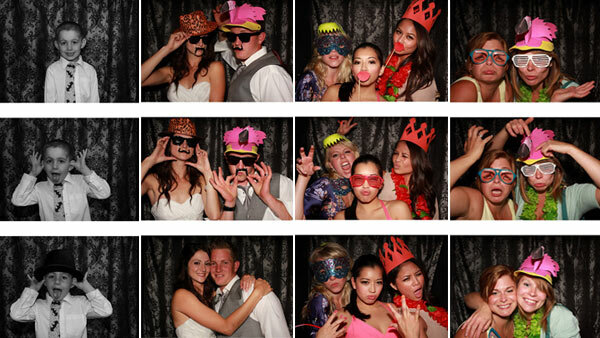 Our photo booth will help capture those memorable moments that you never want to forget. Keep your guests interactive and entertained by having this exciting feature at your function. Props are can be added for that extra "touch". Minimum 2 hour package including customized footer, props, Photo Booth Attendant, unlimited prints and tax is $500. e-mail: info@sunwestdj.com or phone 250-741-1179. Join us on Facebook! Click here to visit our fan page. Discounts are given to combined Photo Booth and DJ Service bookings. Many of our packages can be tailored to suit your needs, contact us for more information. "Name That Tune! "The music trivia game from the 1950s to today's Top 40 hits. Check out our Services page for more information. Planning an "off season" event or wedding? Contact us now for reduced rates!